This direct to gas regulator GAS IT vapour filter has been designed to fit directly to your bulkhead mounted gas regulator via the W20 pigtail fitting. Once fitted you can then connect your exiting W20 gas rubber pigtail to it and you will protect the regualtor and everythihng down stream of it from dirty LPG. 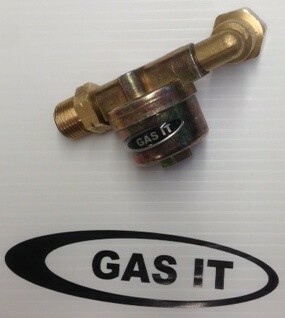 If you then decide you want to connect 2 gas bottles to your filter on your regulator, you can either buy a GAS IT or another brand of automatic change over valve or we also list as an option here a W20 Male x Male x Female T piece with built in none return valves, which will screw directly on the inlet to this filter which then will allow you to connect 2 pigtails to the filter and thus get a twin bottle gas system for the minimum of cost. This direct to bulkhead regualtor filter with the filter its self, universal mounting bracket and 2 bolts to conenct the bracket to the filter.